This alphabet road track busy bag idea from Emma at Adventures of Adam, which is part of our ABCs and 123s series, is such a fun way for children who love cars to learn about letters and numbers too. Adam is a car obsessed three year old boy. He would spend hours playing with cars and roads given half the chance. So I have been tapping into his interest in order to capture his attention when it comes to letter formation. At the moment he is reluctant to pick up a pencil, let alone practise forming letters. 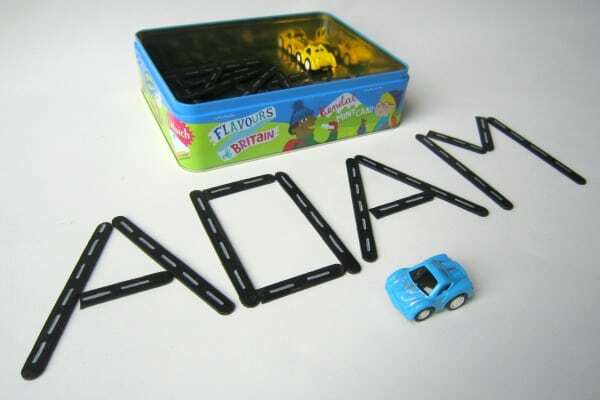 However, by creating an Alphabet Road Track Busy Bag I have found a way to get Adam enthusiastic about forming letters. Step 1. Line a tray with baking paper and spread out your craft sticks. 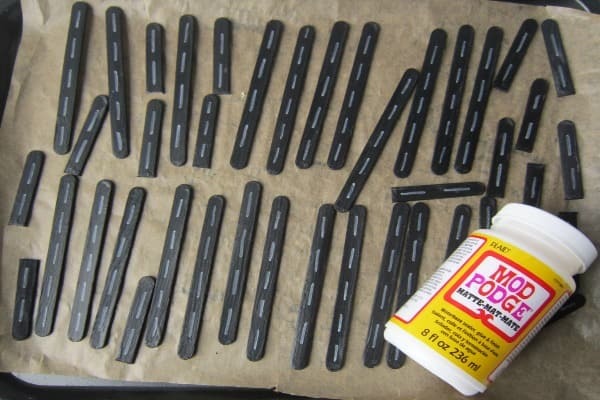 Cover each stick using black acrylic paint. Allow the paint to dry and add another coat of paint. Step 2. Turn the craft sticks over and repeat the process. Ensure that the edges are covered too. Step 3. 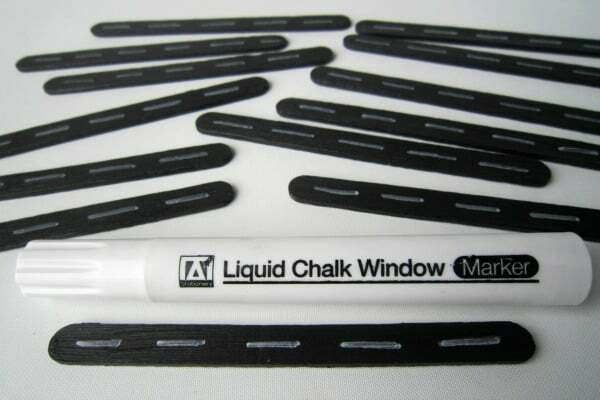 Use a Liquid Chalk Window Marker to draw white lines down the middle of each craft stick. Step 4. Use a pair of sharp scissors to cut some of the craft sticks into smaller sections. If there are any sharp pieces, these will need to be sanded down. The cut ends could either be painted again or I found a black permanent marker pen worked well. Step 5. Lay the craft sticks back onto the tray and give each one a coat of Mod Podge glue. This will ensure that the paint does not chip off or scratch when the craft sticks are in the busy bag. Step 6. Cut strips of magnetic tape and secure them to the side of each craft stick that does not have the white lines on. Step 7. 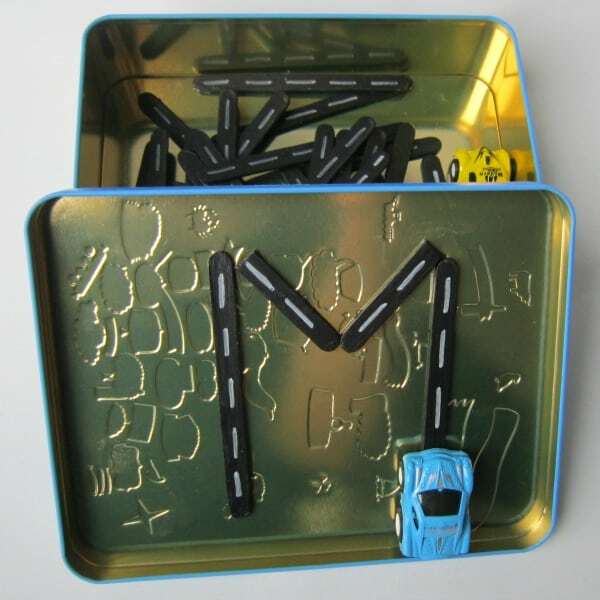 Place the road track craft sticks into a metal tin along with a couple of small toy cars. Your Alphabet Road Track Busy Bag is complete. 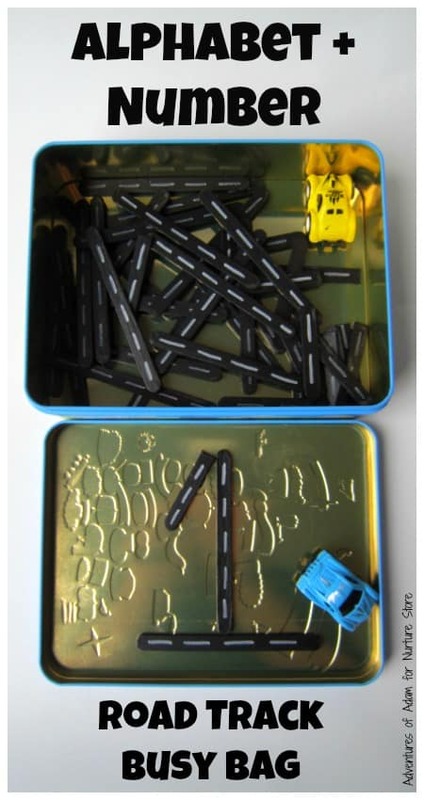 As each individual piece of road is magnetic it will stick to the lid of your metal tin. See what letters your little one can create using the track. The road works best to form capital letters rather than lower case letters. If your child is struggling to form the letters from memory, then you could always add a magnetic letter to the lid to assist them. The car can be used to drive over the letter again and again. This will reinforce the motions needed in order to form that letter. As the road track is contained in the metal tin it creates the perfect sized busy bag. It is easy to grab and take out of the house. It could be used to occupy your little one on a car journey, during a restaurant wait or simply when you need them to entertain themselves independently. The road track busy bag could also be used to create words. My son loved racing his car up and down the letters in his name. 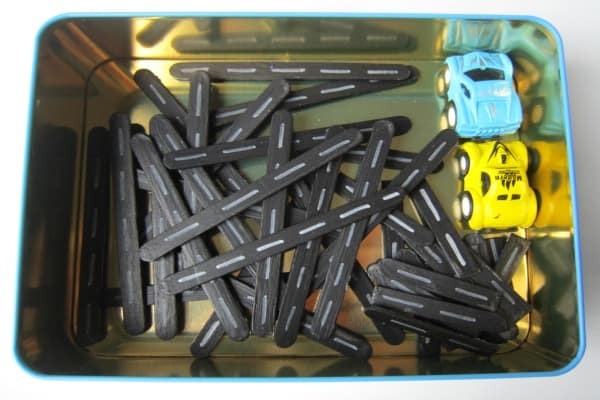 Furthermore, the magnetic track could be used to form numbers. Our Alphabet Road Track Busy Bag gives Adam the freedom to form letters and words without the focus being on writing. Not bad for a handmade activity that cost next to nothing to create. You can see more of our car track adventures over on Adventures of Adam. Our Giant Car Track is perfect for outside play whereas our DIY Car Track Busy Bag makes a fantastic road indoor. Why not take a look at our Masking Tape Car Track which took up most of the living room. I told you Adam was car obsessed! During a difficult pregnancy suffering from Hyperemesis Gravidarum (HG) Emma vowed to make every day an adventure once she had recovered. Adventures of Adam is the outcome of completing a 100 day play challenge with her toddler as part of that promise. Emma has a section dedicated to HG friendly play activities so that Mums can still be part of their children’s play whilst they are ill. Follow Emma on Facebook, Pinterest, and Instagram.